One of my friends is the director of the local art gallery in our community so my kids have had a chance to see various art exhibits. I always keep a close eye on them both when we visit and make sure that they understand that touching the exhibit items is a big no-no. Picasso's rooster is on the loose in this adorable art book. 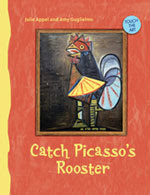 A rhyming, rollicking verse encourages children to search for the rooster while viewing and touching various famous, animal-themed paintings. My personal favorite is the Midwest scene painting of a "Boy Milking Cow" by Grant Wood because it reminds me of our rural area. You can feel the boy's rough denim jeans. 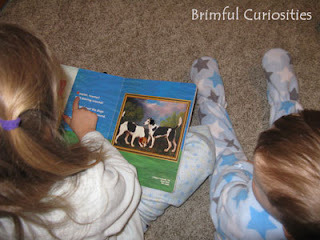 My animal loving daughter prefers the dog painting, "A Couple of Foxhounds" by George Stubbs. She says their ears are really, really soft! There's even a scratch and sniff, though my kids agree it doesn't really smell much like anything -- van Gogh's cheese is a hard scent to try and replicate! The back of the book provides more detailed information about each of the paintings and the artists. My kids prefer this one over the Egyptian art book. The entrance to the tomb of Tutankhamun (King Tut) was discovered on November 4th, 1922 in Egypt, 87 years ago. You can currently get a glimpse of some artifacts from his tomb at the de Young Museum in San Francisco. The kids probably won't be able to touch any of the actual Egyptian objects though. 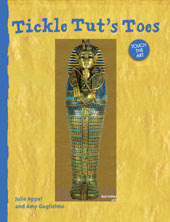 But, if they read the book Touch the Art: Tickle Tut's Toes, they can use their fingers to explore all sorts of Egyptian art, including King Tutankhamun's Gold Coffinette. Toward the back of the book they even get to feel a pyramid! Nine important Egyptian artifacts/wonders are featured. All are discussed in detail in the back of the book. For our stART project this week we decided to try our hand at creating our own Touch the Art pictures craft. 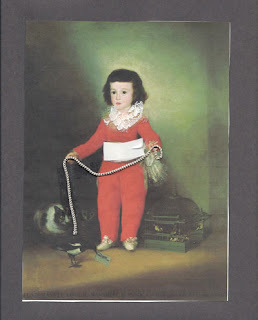 We selected two famous paintings: Manuel Osorio Manrique de Zuñiga (Boy with cats) by Francisco de Goya and A Girl with a Watering Can by Auguste Renoir. 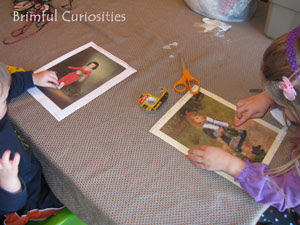 Using double sided tape, we applied various fabrics and craft materials to our pictures. An easy, but fun craft and the kids love touching their creations and learning about famous paintings and painters at the same time. The authors have posted a few other educational art projects for children on their website. Here are the finished products. 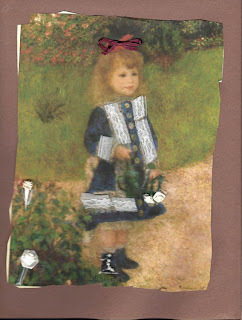 Can you see the ribbon and the string, the frilly lace and the flowers and the buttons on the girl's shoe? By the way, in case you are interested, Booking Mama has a giveaway going on right now for the Touch the Art book, CATCH PICASSO'S ROOSTER. Ends 11/17. This is an excellent project. Thanks for the information on the books. What great books! Kids need more things where they CAN play with books. Loved the young reader following along with their "reading finger," too. Wow! These look amazing! I love the idea of touching the art and your activity idea is perfect. Even if I don't find these books, I will try to do this activity. I think I have some old art books lying around that we can cut up and use. Thanks for sharing this. Wonderful info on books. Thanks for sharing. I'd forgotten about that book series. I'll have to remember to keep an eye out for it. I popped over from Amy's Read Aloud Thursday to see what you all were reading. These books look great! Thank you for sharing about them. I'll have to keep them in mind for when my son is a little older. What great books and what a great project! Thanks for sharing. How very fascinating. I just have to try one of these books - they sound awesome.